I came across this audio series about faeries the other day. It seems to primarily discuss different aspects of the fae; how to connect with them, what they are, where they are, spirituality, etc. There is also this ‘group of 8’ idea that seems to be a topic discussed more than once, which is what Mr. E describes as the 8 seelie (good faerie) nations in his world. You can stream the audio clips right off of the site so you don’t have to download anything. 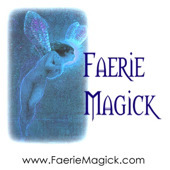 The website http://faeriemagick.com/believe/ is a really cool site about faerie lore and one of the website facilitators, Fiona Broome, has put out a free mini podcast! The podcasts are pretty short, and the narrator explains this before she goes into the topic of the episode by saying that she doesn’t put that much into the podcasts so that she can do research. The podcast seems to be more for people who are just getting into faerie culture, but for those who know their stuff and have been long time fans of the fae, I’m sure you’ll be at least a little bit interested in what she has to say. She doesn’t go into too much detail, but it’s a faerie podcast!! Here’s the link on their site http://faeriemagick.com/believe/faeries-little-faeries-in-history/.